Pardon the techie entry, but I wanted to give kudos to Allen Browne. He is a Microsoft Most Valuable Professional awarded in the Access expertise. I volunteered to design a database for TWC2, and have been dredging my brain for the skills I used to have with Access. A lot has changed since I last created a full-fledged database. I found myself puzzling over how to create a Search field for a form and searched on the internet for examples. Stumbled onto Allen’s page that has an easily installable code module that will enable your form to have “Find as you type” functionality. If you’re looking for Microsoft Access help, his tips page is a great place to start. 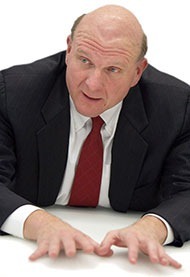 Interview from NYTimes.com with Steve Ballmer. While I may not agree with everything our esteemed leader is doing at Microsoft, I do agree with his way of handling meetings. I find that too many people’s first reaction is to call for a meeting (either in-person or over the phone). A meeting is immediate, in-my-face, and requires a dedicated, scheduled chunk of time. However, frequently it’s someone making a presentation and then sitting there waiting for me to respond. I’d rather get the materials first, review, and send in my initial comments over e-mail. After that, if there is excessive follow-up needed, we can meet and discuss. It’s pointless to have a meeting where I sit there and listen to someone rattle off the exact bullet points I could have read myself on the PowerPoint slide. It’s a waste of the presenter’s time and it’s a waste of my time. It also leads to forced, snap decisions. With your love of fast cars, loose women, and an unhealthy appetite for exercise, it’s a surprise we’re such good friends. You rode the line between idiocy and balls-out aggressive confidence many a-time. The day you left your job is legendary. Any sane man would have played along and taken some blame. But you? No. “Do you know who I am? I’m the thundercat, baby. I quit.” Who else would have had the guts to say that to an HR professional? I admire that. They question your tactics on how and why you got to be #1, so you ditch them. 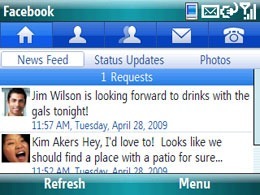 Finally a Facebook application for Windows Mobile has been developed! As a Microsoft employee, it saddens me to see Windows Vista get (what I consider) unfairly slammed. I think there were mistakes during the initial release and we encouraged people to install it on hardware that quite simply wasn’t capable of providing a good experience (i.e. low system memory, slow processor). Vista never recovered from the poor initial reception. It’s a pleasant surprise to see so much positive news about our upcoming Windows 7. In a nutshell, Windows 7 is “faster and easier” than Vista. I’d encourage you to try it out for yourself. I like it so much that I am taking the release candidate and installing it on all my machines… home desktop, netbook, and primary work laptop. You can download and install the Windows 7 Release Candidate for free. Since it is pre-release software you may encounter problems (I haven’t though!). 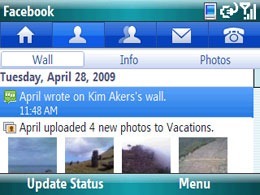 It will be available for use until March 1, 2010. My take on it is you get the speed of Windows XP + the reliability and enhanced features of Vista. (Plus new features of course – it’s easy to have multiple windows nicely aligned… window manipulation was such a pain in the past). Dedicated to Singapore’s Feminist Mentor. I can’t wait for July 10. (Looks like you will have to click on the video and go direct to Youtube as it requires age verification to watch it).